Product prices and availability are accurate as of 2019-04-19 09:48:54 UTC and are subject to change. Any price and availability information displayed on http://www.amazon.com/ at the time of purchase will apply to the purchase of this product. 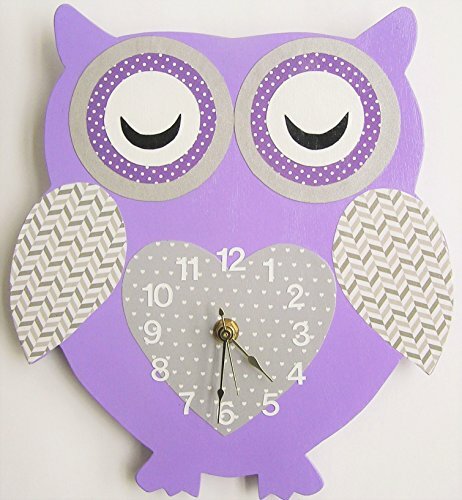 The clock has lavender base with grey/white chevron pattern wings, grey heart pattern heart. The eyes are grey with grey heart pattern, and black eye lids. This adorable Owl wall hanging clock is hand made in the U.S. The clock is made with MDF wood board, body is hand painted ,wings , eyes, and body are decorated with decoupage paper. The clock measures 11" (L) X 9.5 (W). We can customize the clock to match your room decor. Please send us a convo. The clock comes with a U.S. made silent quartz clock movement mounted in the back with a hook. The clock requires one AA battery which is not included. Please NOTE: the clock will be shipped with the hands not attached so that the have every chance of arriving in excellent condition. instructions on how to attach the hands will be included with the clock.